Meet the 2019 Worship Team! Rev. Vickey Gibbs has the pleasure of ministering with and to the people of Resurrection MCC and Los Casa de Todos in Houston, Texas. She serves as the Associate Pastor. She is a member of the Houston Coalition of Black Affirming Pastors, Houston Faith Leaders Coalition, Planned Parenthood Faith in Action Cohort and Texas Advocates for Justice. Vickey serves on the Board of the Montrose Center Women’s Programming Advisory Committee. She loves living in the most diverse city in the United States of America as it affords her to opportunity to immerse herself in the cultures of people from around the world. She loves learning new things and is looking forward to the joy of being a part of such a diverse group of people who will co-create the worship experiences for General Conference 2019. She is married to Cassandra and is the co-parent of two lovely young women. Rev. Dr. Kevin Downer brings years of experience in transformational ministry as Interim Pastor to MCC San Antonio, All God’s Children MCC in Minneapolis, and Founders MCC in Los Angeles. He is the founding pastor of aChurch4Me? MCC in Chicago and was the Executive Pastor of MCC’s largest congregation MCC Toronto. He is currently the Interim Minister at Greendale People’s Church in Worchester Massachusetts. Prior to becoming a pastor, he spent 14 years as an international business consultant. 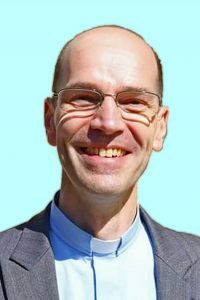 He holds a BS in Computer Science, an MBA with concentrations in finance and marketing, and an MDiv from Austin Presbyterian Theological Seminary. He recently received a Doctor of Ministry from Chicago Theological Seminar. His doctoral thesis was titled “Transforming Community: Dialogue and Inquiry as a Just and Loving way for Leading Increasingly Diverse People beyond Fear, Loss and Uncertainty.” Kevin and his spouse Toby have been together for over 17 years. Rev. Emma Chattin joined MCC in 1997 and was ordained in 2004 while working on a church plan in Harrisonburg, VA. She now pastors MCC Northern Virginia (MCC NOVA) and serves her community in many different ways. 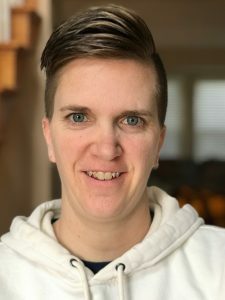 Emma is also the Executive Director of the TransGender Education Association of Greater Washington DC, whose mission is to support individuals in transition (anyplace along the broad spectrum of gender identity, whether static or dynamic), and the communities into which they are transitioning. In this capacity, she leads Trans and Gender Awareness training and educational presentations at places of employment, hospitals, schools, seminaries, and houses of worship of all denominations. Emma is a founding co-facilitator of several support and community building groups for the Trans community, including Parents of Trans-youth, Trans & Gender Non Binary Tweens & Teens, as well as Spouses of Those Who Identify as Trans. She lives in Northern Virginia with Heather, her wife of 21 years. Ana Ester Pádua is a lay delegate from the Church of the Metropolitan Community of Belo Horizonte. Journalist and theologian, she is also a teacher and doctoral student in the Sciences of Religion by PUC Minas. Ana is a member of the Brazilian Association of History of Religions, ABHR, and the Brazilian Association of Homocultural Studies, ABEH. 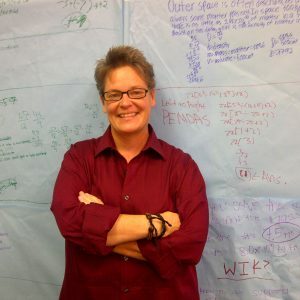 She currently devotes her studies to Feminist Theology and Queer Theology. In addition, he has experience in organizing events, having worked at the BESC Institute of Humanities and Economics. Jane Syftestad received her formal musical training from UCLA and the Manhattan School of Music. She has traveled around the world with two gospel groups, “David and Jane” (1990-1998) and “2gether Blessed” (2010- present). 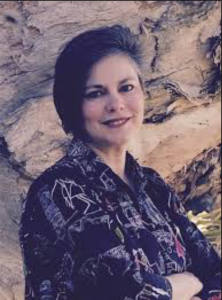 Jane has been a middle school teacher for 24 years and Director of Music for Founder’s MCC Los Angeles (California, USA) for 14 years. She has served as singer, pianist, arranger, conductor, and songwriter at many General Conferences. When conservative Christian protesters picketed a “David and Jane” concert in upstate New York in the early 1990’s, she and singing partner David Heid snuck outside, grabbed signs, and marched with them until the protesters found out. She is excited to be back on the General Conference Worship Team to lead music! Rev. Phyllis Hunt was born in St Petersburg, Florida in 1957. She grew up Southern Baptist and Assembly of God finally finding King of Peace, MCC at the age of 28 were she became a member in 1987. She shares her life and ministry with her partner, Vilia Corvison of 22 years, and their 9 year old Chihuahua, Pepe LePew. She holds a B.S. in Business and an M.Div. from Pacific School of Religion in Berkeley, California. 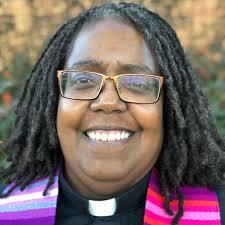 She was ordained in 2001 and her gifts for ministry include preaching, teaching, pastoral care, and community activism. 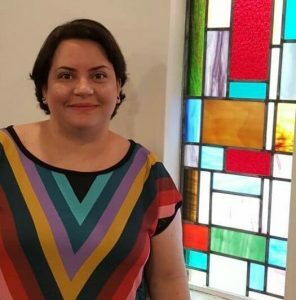 She served as interim pastor for one year at St John the Apostle in Fort Meyers, Florida, ten years as senior pastor at MCC Tampa and currently works at Tampa General Hospital as a staff chaplain. 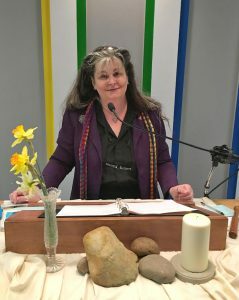 She is a gifted liturgical artist using, paint, fabric, construction materials, earthen elements, and many other materials to transform meeting rooms into sacred spaces as she visually interprets the sacred text, music, liturgy, and worship themes. Rev. Katie Hotze-Wilton started attending MCC of Greater St. Louis in 2003, and within a few years, began working toward ordination. She graduated from Eden Theological Seminary in 2011 and was ordained in 2013. She has worked with Dr. Marcia McFee at the Worship Design Studio and has 11 years of worship planning experience in family- and program-sized churches. Katie has participated in three General Conferences, serving in roles from camera operator to technical director to member of the worship planning team. She makes her home near St. Louis, MO with her wife Jenny and their two children Owen and Olive. Katie is grateful for the opportunity to serve as the Pastor of Family Programming at MCC of Greater St. Louis. She enjoys being part of a creative and dynamic team.